I think an Alabama win and Texas win are needed (as well as OSU win) for the Buckeyes to get in. Obviously the NCAA can't go to an 8 team playoff because it would interfere with the student-athlete's studies. Notre Dame must be feeling pretty good about being an independent this year. No chance they lose and get knocked unlike Georgia who has to win to get in. If that happens and Oklahoma and Ohio State get left out there has to be expansion. I favor 6 teams, with byes for the top 2. That^ would likely get me my wish, if it's done without extending a week. If a full week gets added to the process, it'll be 8 teams just to get the TV sets. 1 v. 8s and maybe 2 v. 7s will be crap games, but we'll all watch at least the first halves. First, Conference Title games are superfluous and nothing more than a $ grab. Second, Bama and UGA basically had a week 11 bye playing The Citadel and Furman. ND was playing a top 15 Syracuse team. ND’s Regular Season Schedule is usually difficult enough to washout not having that 13th data point. Which is more important, best win or worse loss? If you are trying to beat the 1st, 2nd, or 3rd ranked team in the nation, I would pick the team who has shown they are capable of doing that. Try to be honest though, if OSU played in the Big XII I would say they give up many more points this year. The Big XII offensively is a much better league than the Big Ten. WVU for instance would put up 40 on OSU. Honestly, I can't say that, all the defenses are bad in the Big 12 not just this year but every year. Kansas would not score 55 on OSU or 40 like they did on Oklahoma. Out of the 5 teams that scored over 40 on OU, 3 of those teams were unranked. And Texas Tech nor Oklahoma State puts up points on the road so no I can't say that. 1. When ND beat Mighigan, Michigan was not the #4 team in the country and did not have the #1 defense in America. ND schedule has benefited them this year plus they struggled in their last game. There's your logic! 2. It's not debatable at all. Alabama was favored to beat LSU. OSU was a 4 point underdog plus Michigan was #4 and OSU was #10 and dominated the #4 team in the country. There hasn't been a more significant victory this season. And, I posted three times as you correctly stated, I said that OSU has an argument I didn't say that this will happen. 4. I made a mistake posting 3 times my apologies for annoying you. 1. Notre Dame still beat Michigan. Just because Ohio State beat them this week and ND beat them week 1 shouldn't discredit Notre Dame. 2. Bama went to LSU and shut out the Tigers. It was supposed to be their toughest test of the season and they blanked them. If you want to use the Rankings and say most impressive upset, then sure that's a no-brainer. 3. I know what Oklahoma has given up, but everyone in the Big XII scores - Ohio State gave up those big point totals to bad B1G teams. ND also beat Michigan w/o their now Starting QB and RB. They wouldn’t hang 62 on Michigan, but they’d win by a wider margin than when they first met. 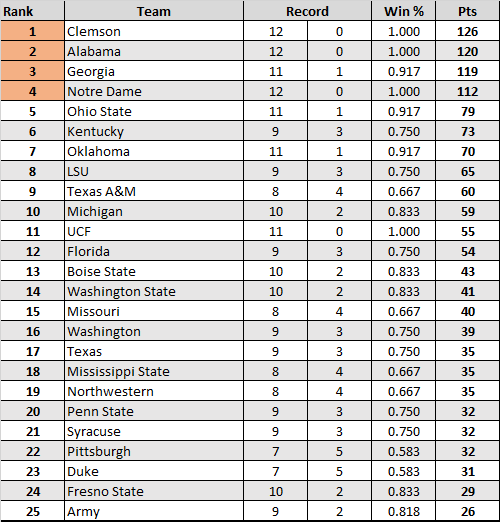 Also, you can’t ignore how crappy OSU looked leading up to the this week. They struggled with Nebraska, a sub par Mich St, and should’ve lost to MD. The entire season’s work matters, not just one game. If that were the case, Purdue would be a lock for the Playoff. So ND beat Michigan but it isnt as good bc they werent ranked #4 when they did it/werent the top ranked defense? Sound logic. If OSU and OU both win with pretty much the same 'enthusiasm' then I believe OU deserves to be in. At the end of the regular season (incuding conference championships) the CFP committee should. Rate all teams with 13 wins. Rate all teams with 12 wins to determine if any should move ahead of the 13-win teams. Rate all teams with 11 wins to determine if any should move ahead of the 12-win teams. And teams should not be moved up or down more than one win level. 11-win teams cannot be moved above 12-win teams and 13-win teams cannot be moved below 12-win teams. Or just not get blown out by Purdue and you dont have anything to b1tch about. Face it Urban teams the past two years have laid huge eggs that cant really be overlooked. It isnt that they just lost, they got blown out. When style points count you cant leave anything up to the subjective playoff committee and Condi Rice. HELPS when they finish the regular season undefeated as they don't have that extra game to trip them up which has happened 3 times since 1980. It HURTS them if they finish the regular season with 1 loss which also has happened 3 times in that time frame. They know if they go undefeated they are golden, just like any power 5 school no matter how pissy their schedule and OOC opponents. Arrogate is right, you just cannot get throttled like the loss to Purdue and Iowa last year. If they just lose a close game vs Pur this likely isn't an issue. Notre Dame would still be 12-0 whereas OSU, OU, UGA and Bama all could/would be 12-1. So ND should be punished because they don't have the extra game? Like Bama wasn't punished last year after losing to Auburn and sitting home during Championship Weekend. This isn't the pros, there are way too many teams to rank them like that. I believe overall that being in a conference HURTS ND to get into a playoff......UNLESS they are undefeated. By not having a Conf champ game it is one less game to play against a good foe. It will never happen, but if there were undefeated teams with ND and the other four from power conferences then ND doesn't make it. Same on any tie breaker with ND having one loss vs a 1 loss conference champion, I can see that hurting them as well. As is, that's not the case this year. Now if nutsnbolts said the opposite, that teams should be ranked based on the number of losses (which essentially they are now), then ND is in the perfect spot at #3. Or if they all had 1 loss and ND had one loss. Back before the conference networks I could see why ND would want all that NBC money to themselves but the BN is making those teams a fortune. No reason NOT to join the Big ten or a conference. Easily made schedule. Still schedule a cream puff or two in the out of conference. Guarenteed to have 7-8 home games and play most OOC games as just a home with no return trip. Few easily conference games, a couple built in tough games and boom, a schedule is made. Isn’t the goal of playing the games to win? Why should not winning be rewarded as much as winning? I agree with everyone stating tOSU just needed to win against Purdue and they wouldn’t need to worry about style points. The CFP committee is meeting one day after the conference championships to select the four teams. Why couldn’t they have met last Sunday and selected eight? Then this weekend could have been the top four hosting the second four. No change to bowl games and dates and no change to the final three games for NC. If OU wins by 1, and OSU wins by 50, then the nod still goes to OU. The Bucks' only prayer is if OU and Georgia both lose. I have zero interest in watching them get curbstomped in the semis anyway. Let's go to the Rose Bowl, beat Washington, and call it a nice year. Because not all teams play the same schedule. Not all wins are equal. This isn't the Harbin system. Conferences like their $$$ too much. Pretty crazy that the top 5 pre-season teams(per the coaches poll) are all still in the top 6. A couple upsets here and there, but this has largely been a formulaic season so far. Very unlikely this happens, but what if UGA, OK, and OSU all lose? If UCF still had their QB, maybe they would get their chance. However, with him out, I’m guessing UGA gets in. Very true for who the real contenders were. 3 of the preseason top 10 did have 5 losses though. But I dont think anyone thought Miami, Wisconsin, and Auburn were real contenders. The real contenders for the playoff was never really in doubt. Aside from ND, there were no real surprises for who was competing for the 4 playoff spots. I thought they would have lost one by now and out of real contention. Seems like it will be Bama, UGA, OSU, OU, Clemson for the next few years. I do think Jimbo will have a year every now and then where they are contending for a spot. Some surprises. Cinci, Syracuse, Army?